A thorough course for learning all relevant IFR knowledge in preparation for Transport Canada Instrument Rating written (INRAT). Includes all relevant regulations, aviation weather, flight instruments, IFR charts, pre-flight and in-flight IFR procedures. Coded subjects, detailed index. 224 pages, perfect bound. Contains 6 sets of INRAT exams for Transport Canada Instrument Rating written. Exams are cross referenced to our Instrument Rating Ground School Course, 2001 Edition. A very useful prep system to ensure readiness for latest INRAT. 224 pages, perfect bound. A focused and user-friendly self study course for Canadian helicopter pilots. 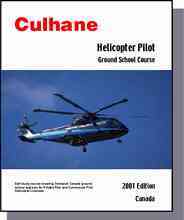 Contains all required subjects for both Private and Commercial level Helicopter Pilot Licence writtens (PPHEL and CPHEL). Coded subjects, detailed index. Written for a rotary wing audience - no irrelevant fixed wing materials. Includes all Transport Canada subject reference codes, internally referenced. 224 pages, perfect bound. This manual contains 600 questions, organized into six sets of 100-question sample exams: 3 PPHEL for the Private Pilot Helicopter written, and 3 CPHEL, for the Commercial Pilot Helicopter written. Completely up-to-date for new GFA weather format, this test supplement has been cross referenced to our Helicopter Pilot Ground School Course, 2001 Edition. All required charts, diagrams, answer selection sheets and answer keys are included. 224 pages, perfect/cirlox bound. This course contains all study subjects for Helicopter Airline Transport written exams: HARON (air law, airline operations, navigation general) and HAMRA (meteorology, radio aids, flight planning). Coded subects, indexed. Up to date for new GFA weather format. Includes 2 sample exams (1 HARON, 1 HAMRA). 224 pages, perfect/cirlox bound.